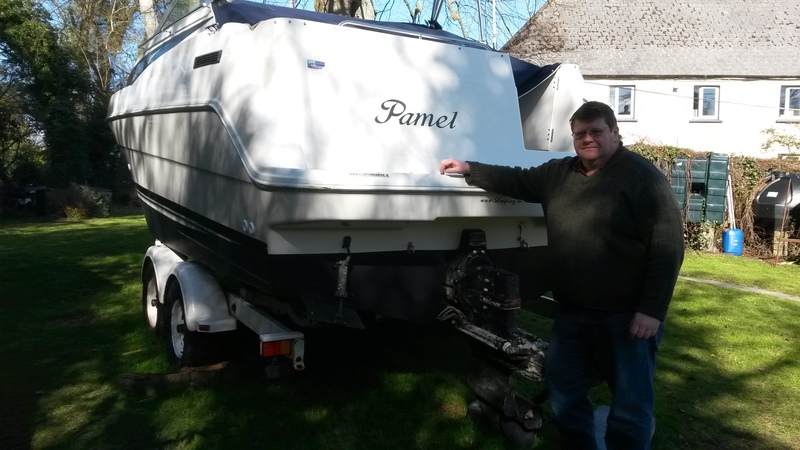 Work finished on the stunning Pamel, and doesn’t it show? She is absolutely gleaming and a credit to her owners. Shown here with Mell, who has her ready in time to be launched for Easter. 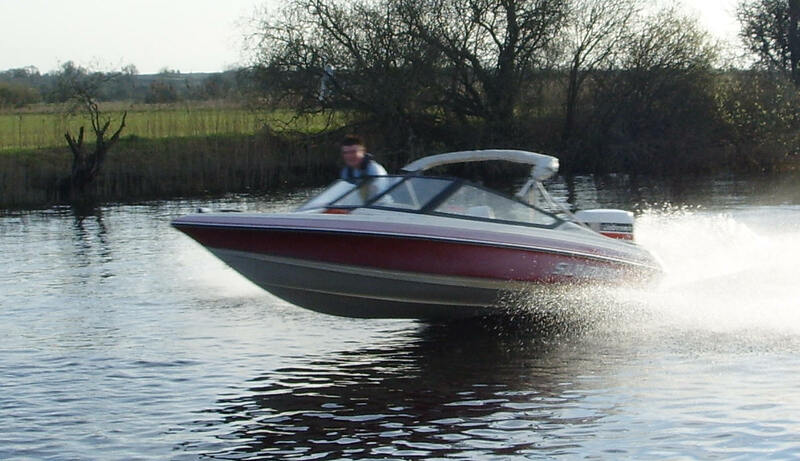 Wishing Mell and Trish happy boating this season, and looking forward to catching up on the Shannon. 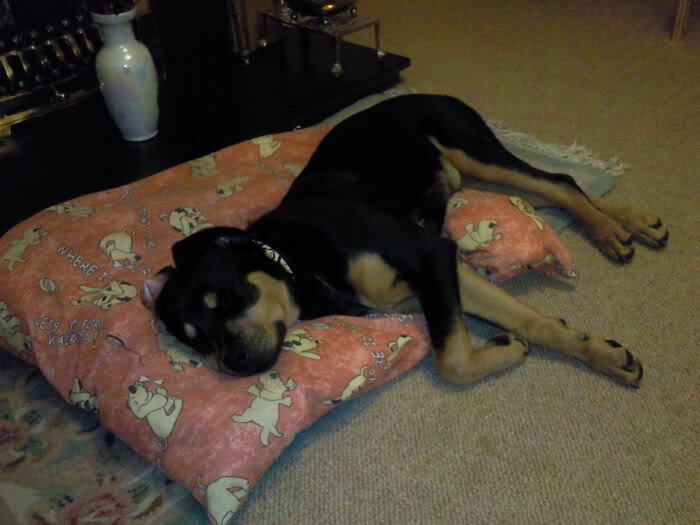 We agreed to look after a Rottweiler puppy for a week as it was an emergency. 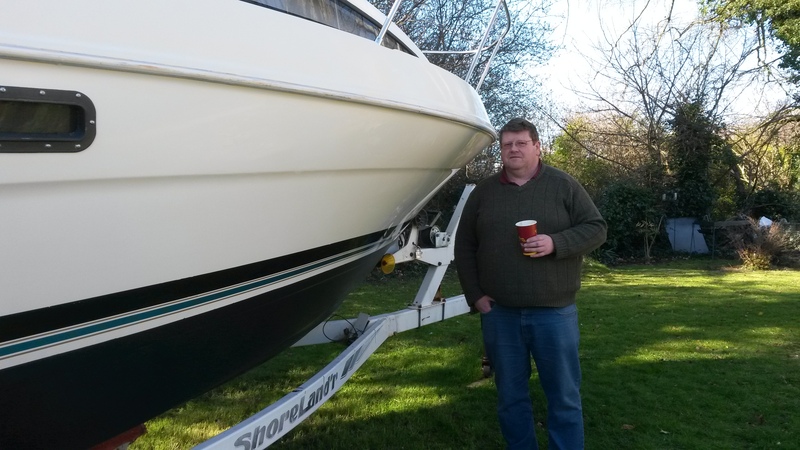 The story starts at home, and finishes with a weekend on the boat. 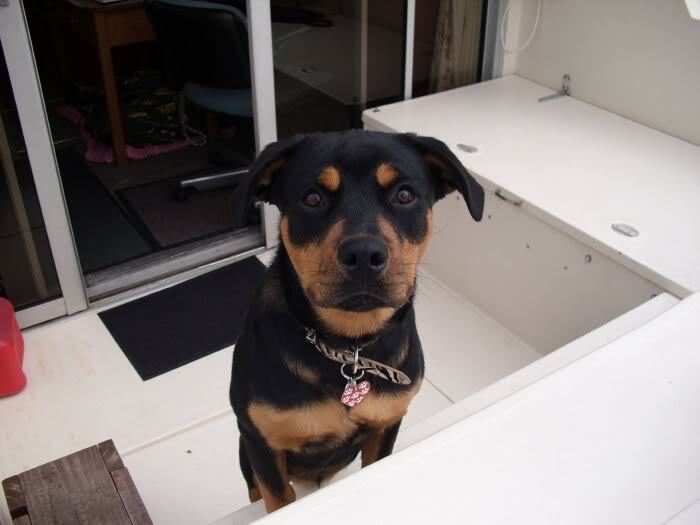 The weekend on the boat was interrupted by a request to look after a Rottweiler puppy. 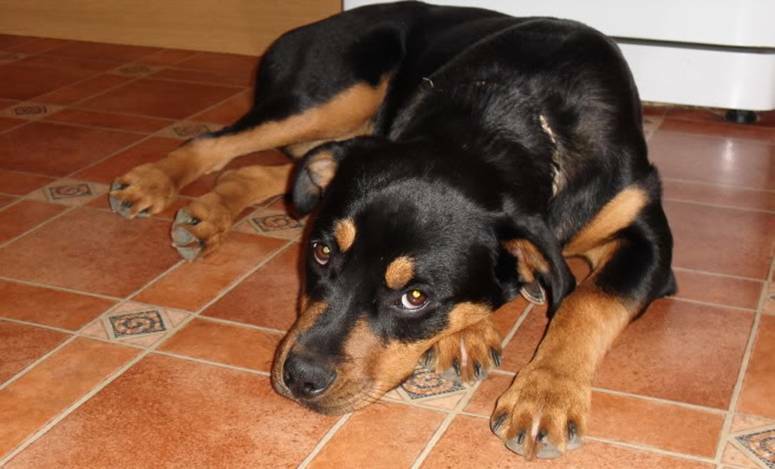 Initial reaction – a Rottweiler? You must be joking. Those things are vicious and eat children and small animals. No thanks. But we were prevailed upon, and because it was a bit of an emergency, we agreed to mind her for a week. We met Suki for the first time when we collected her. She seemed friendly enough. Very big for a puppy though. She was a well-prepared dog – she came complete with her own doggy bed, a bag full of leads and toys, a food bowl and a large bag of dry dog biscuits. It was her first time in our house. She stood in the kitchen and just looked around, a bit lost and not sure what to do next. We put her bed down and tried to feed her one of her dog biscuits. She turned her nose up at them. Suki helped herself to a chow mein, prawns and all, when it was left on the kitchen counter by mistake. Suki wasn’t about to stay downstairs on her own overnight. Apparently she likes sleeping on the bed. Eventually she agreed that maybe the floor was a better place for a dog and she fell asleep at the end of the bed. Nearly fell out of the bed with fright when she barked during the night. Wow this dog can make noise. We had been assured that she was housetrained but how does a non-dog person know when a dog “asks” to go out? During the night she kept putting a paw on the bed and waking me up. When she got a bit insistent, I got up to let her out. She must have been bursting, poor divil. She came straight back in again. But getting up in the middle of the night to let her out didn’t work, and in the morning there was a nice smelly heap in the hall. Jeez what a stink. I picked up the rug and put it outside. Deal with that later. She threw up in the back of the jeep on the way to work. Not sure if this was car sickness or the chow mein. But she was good during the day and happy enough at work. On Monday night, it was wet and miserable. Mike took her for a late night walk and he walked her up and down the hall on rugs to try to dry her feet – did you ever try to dry a dog’s feet? Anyway, she pottered around the kitchen and back into the hall and then cane into the sitting room. Where I noticed that the carpet was turning red. Oh god the dog is bleeding to death. One night and we have killed her off already. Turns out she had cut on of her pads out walking, and by golly do they bleed. I put antiseptic cream on it (cos I googled dog injuries, not knowing any vet in the area, or any vet at all for that matter, and google says that pad injuries are prone to infection). But she licked the cream off straight away. We considered bandaging it. Lots of head scratching. And carpet cleaning. Hard work. She fell asleep and all seemed ok, til she woke up and started bleeding all over the carpet again. More cream. More carpet cleaning. More head scratching. We put her bed into the living room, and Mike slept on the couch so he could let her out in a hurry if needs be. And she did need. But that didn’t stop her leaving another smelly heap in the morning. We took her to the Phoenix Park for a walk. Dogs love long walks to tire them out, don’t they? Suki certainly does. She tried to chase every person we met, all the better if they had a dog. But dogs also love rolling in godknowswhat. In the jeep on the way home, we nearly passed out with the smell off her. Mike said we had to wash the dog in special doggy shampoo. And we could buy some tomorrow. Sorry but I couldn’t wait til tomorrow to get rid of the smell. Coconut shower gel would just have to do. Into the bath. Bless her, she sat still while we figured out how to shower a dog. Her big brown eyes looked so sad with water dripping into them. She was filthy. Took ages to rinse off the shower gel. And even longer to get the water out of her coat. Her coat was like a sponge. She just kept dripping no matter how hard we towelled her. Several towels later and we gave up. Out with the hair dryer. Again she sat still and waited for me to dry her. But even washed and dry, she still stank. Nothing like a wet dog to smell. In the living room, she was instructed to stay on her bed and placed several times on it. But she thought it was just a game, and kept just 2 feet on the bed, with every other bit of her damp self on the carpet. On Wednesday night we had a meeting after work, and Suki just sat in the jeep and waited. Not a peep out of her. And what a divine coconut scent, and a lovely, shiney coat too. At this stage we are beginning to like this dog. There isn’t a vicious bone in her body. 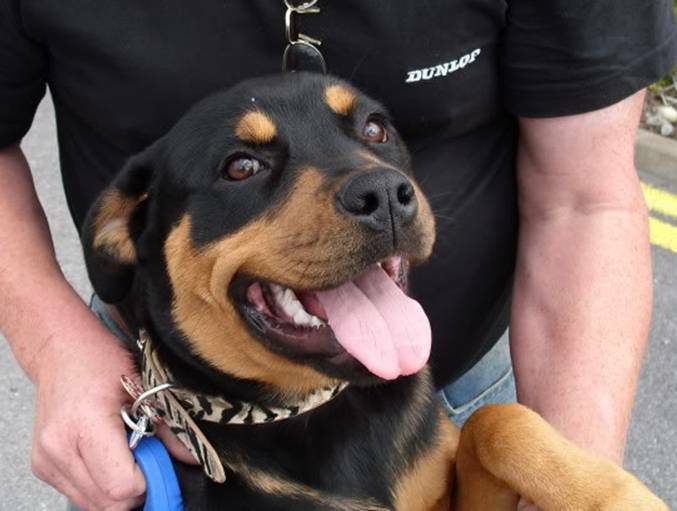 She is a happy, smiley affectionate puppy who just wants to kiss everyone. This isn’t what I thought Rottweilers would be like. I mean sweet natured. A rottie? (I was also getting with the lingo, courtesy of my friend google). By Thursday we had her housetrained. Or maybe it would be more accurate to say that we had learned when to let her out. The big test. We took her down to the boat. Suki was good about jumping off the boat, with enough sense to take her time and not to fall in. She got upset when Mike left her on the boat and drove off without her. She stood at the back of the boat and watched the horizon until he came back. When we went for a pint we left her in the jeep and, again, she was perfectly behaved. That night we put her bed under the table. Perfect spot we thought. Just the right amount of space for a dog and no danger of anyone tripping over her. Suki didn’t agree. She wanted to sleep in the cabin with us. She didn’t seem to mind that the floor space (this is a boat remember) was about 12×18 inches. We squashed her doggy bed in and she curled up and slept. We were beginning to suspect that she was a bit clingy. 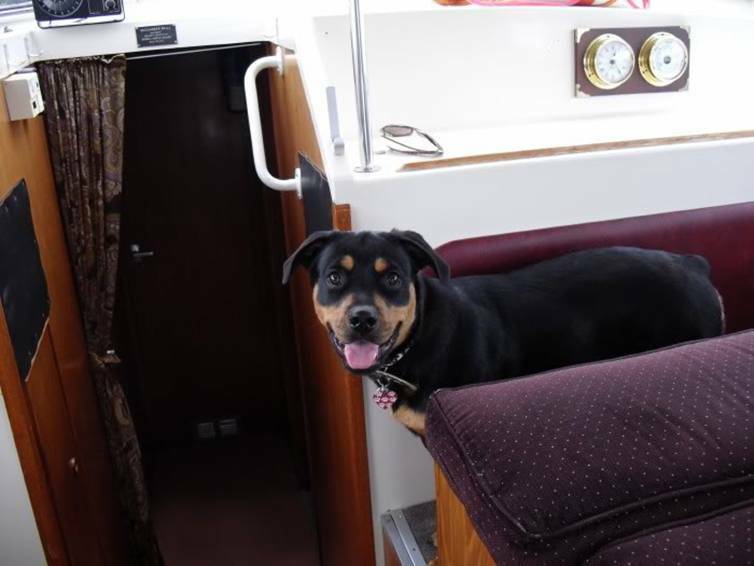 She tends to follow us everywhere around the house, and she was the same on the boat. And she doesn’t like it if you are on one side of a door and she is stuck on the other side. She seems to have really settled down on the boat. We went into Carrick for some shopping. While we were there we got some doggy stuff. We couldn’t resist…. got another doggy bed (her old one was beginning to smell a bit!) and doggy treats. We also got her some tins of dog food because we couldn’t get her to eat any of the dog biscuits. She just didn’t seem to like them. One of the toys she arrived with was a thick piece of rope with 2 knots in it and a tennis ball at one end. The tennis ball lasted about 2 seconds in her jaws. So we replaced that as well. When our friends Simon and Miriam arrived for the weekend, she didn’t make strange with them at all. TG they didn’t seem to mind sharing the boat with a dog either. Of course, I didn’t tell them that I had found her asleep on their bunks. She likes beds! Off we set for Dromod. This is a small village in Leitrim, with nice pubs, good food, lovely walks and a picturesque harbour. Suki loved it! We took it in turns to walk her. Lots of lovely things for her to sniff around the harbour. We took her for an afternoon pint, and she sat under the table while Simon and Miriam jumped around like possessed maniacs. They are afraid of wasps. Terrified might be a better word. There were a lot of wasps. Later that night we went for dinner and couldn’t take Suki with us into the restaurant. So we left her on the boat and prayed. But we needn’t have worried. There was nothing eaten, damaged or torn apart. She got up onto the table so she could look out for us. Hadn’t the heart to give out to her for being on the table cos she just looked so cute! This dog is having an effect on us. Suki had a dicky tummy. We are getting used to this. She had wolfed down the tinned dog food the previous day so maybe it was the change in diet. More carpet cleaning. We were very sad to see Suki going home. For all the trouble and hard work she caused, she was an absolute dote. Such a lovely temperament. If Suki is typical of this breed, it has been much maligned. She was well behaved on the boat, making the best of it. But the carpets didn’t fare so well. There are a few threads missing where Suki pulled them out with her teeth. And we had to buy a mat to cover up stains we couldn’t wash out of the carpet. 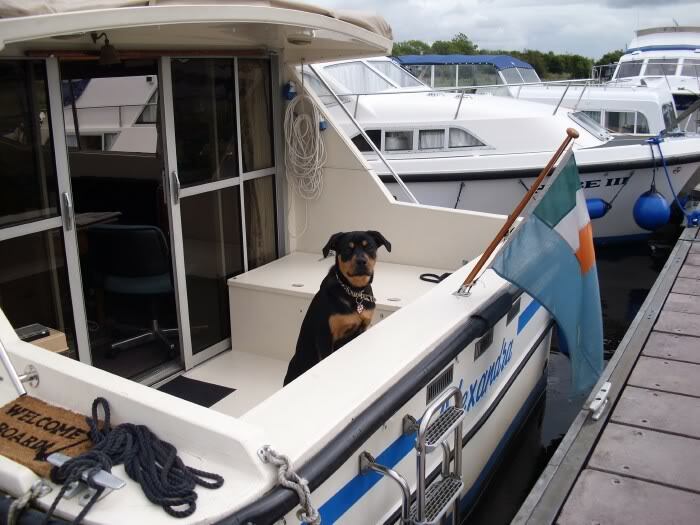 Advice if you have a boat and want a dog? Well, make sure it is house trained and sort out its diet before you bring it anywhere near a boat! How’s this for a smile? Posted on 13/03/2015 13/03/2015 Categories GeneralLeave a comment on Woo hoo! After a spell hiding in cyberspace, I am pleased that I have re-entered the online world. Still at the early stages, but the new site will continue to be developed. 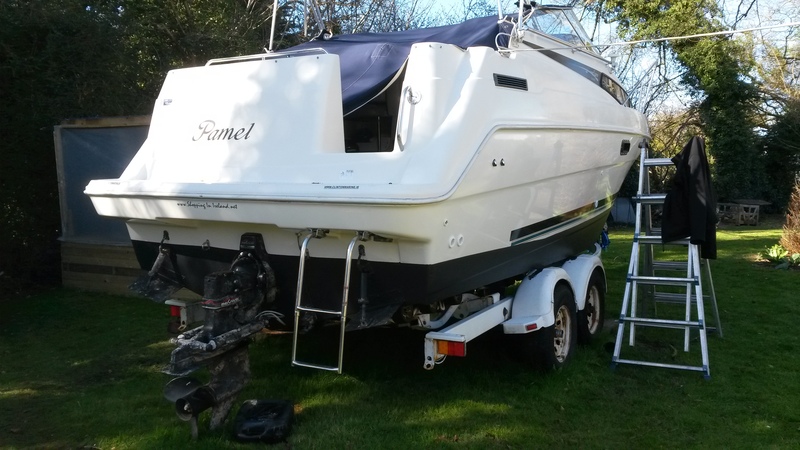 In the meantime, contact me at info@clintonmarine.ie, and I would be delighted to help with queries on your engines and boats. Posted on 13/03/2015 16/03/2015 Categories GeneralLeave a comment on Hello!